Cognitive understanding of how students learn; emotional preparation to relate to many students whose varied needs are not always evident; content knowledge from which to draw different ways to present a concept; and, finally, the ability to make teaching decisions quickly and act on them. So how do they do that? Let's break it down. Transmission: Where "the teacher's role is to prepare and transmit information to learners" and "the learners' role is to receive, store, and act upon this information." Transformational: Where students' active engagement in developing knowledge and skills, critical thinking, higher-order skills, and communication are facilitated by the instructor. What Does Transformational Teaching Look Like? Have students ask questions and solve real-world problems. Questions should require students to: analyze, synthesize, create, empathize, interpret, reference background knowledge, defend alternative perspectives, and determine what they know and don't know. Organize students into learning groups. Make learning segments manageable through modeling and mastery. Guide, facilitate, challenge, and support. I learn best when the teacher is hands on and doesn't just talk at me. They need to be interested in what they're teaching and encourage class discussions. Not only does this encourage us to use what we learned, it also helps us see the information in a different way. Transformational teachers know that artful teaching without science lacks efficacy, and scientific teaching without aesthetics lacks vision. Says child psychologist Dr. David Elkind, "The art comes from the teacher's personality, experience, and talents. The science comes from knowledge of child development and the structure of the curriculum." The art and science of teaching work in harmony. Writes Richard Bankert, an eighth grade science teacher, "The best teachers are artists who know the science of teaching." In contrast to immature teachers who fill a 90-minute class with activities (and ignore targeted objectives), a transformational teacher treats those 90 minutes like a carefully crafted persuasive essay -- with a clear purpose and unique sense of style, a memorable beginning and end, a logical sequence, important content, nimble transitions, and contagious passion. Together, these characteristics persuade students to believe that learning the content and skills really matters. Combine different ideas to form a new concept. Reflect on the justification of one's own beliefs and values. Nobody said this stuff was easy. But when teachers model symphonic thinking and students internalize it, graduates are better able to thrive in the new economy, according to Pink. What if a person was having trouble doing a pull up for exercise? Instead of giving them some other exercise, I could help them by doing the pull up for that person. Right? No, that wouldn’t actually be useful. However, if I push on the person's feet a little bit, they can still struggle and still exercise. Warning: allowing productive struggle to occur consumes more class time. But retention is undermined when learning is frictionless. Purposeful struggle today means less re-teaching tomorrow. 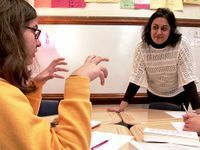 Allowing productive struggle to occur, using artistic and scientific instruction, modeling symphonic thinking, and encouraging students to lean into constructivist problem solving can lead to the holy grail of transformational teaching: epiphany. We hope you'll tell us about your transformational teaching in the comment area below.